The Indian Plume quilt block makes good use of the very common half square triangle. In fact, other than a few squares thrown in, this block is comprised of only half square triangles. Although there are no difficult individual patches to make in this quilt block, I have assigned it as an intermediate level of difficulty due to the large number of pieces that make up the finished quilt block. But, don't let that stop you. If you just take care with the precision of your seam allowance you will have no difficulty making this block. The two sample quilts illustrated show just how very different you can make your quilt. 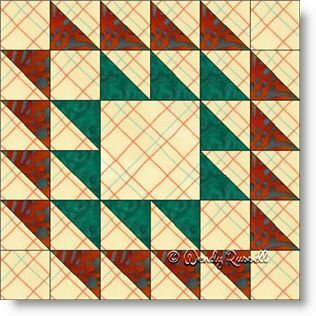 When the quilt blocks are set side-by-side, with a rotation of the block, this results in a secondary pattern emerging. By setting the blocks on point you have an additional opportunity to play around with the colour of the background. There is no end to your chances to be creative.